The runt of his litter, Jack wasn't Laura's ideal candidate to serve as a therapy dog at the senior center where she worked—or was he? He was the runt of the breeder's litter. 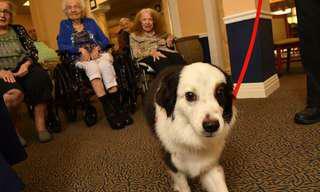 That's the first thing Laura Diachenko noticed about the black-and-white Miniature Australian Shepherd. Unlike the other puppies, this one wasn't squirmy. He clung to her when she picked him up. Could he be the one? she wondered. She'd only visited the breeder on a whim. No. No way. He wasn't the right breed for starters. Laura wanted a big dog—specifically, a Bernese Mountain Dog—that she could train to be a therapy animal. It had been her dream for 22 years, ever since she'd been laid up for a week in the hospital recovering from back surgery. The one highlight had been the visit she received from a Bernese Mountain therapy dog. Now a senior living counselor at Gulf Coast Village, a Volunteers of America–sponsored retirement community in Cape Coral, Florida, Laura felt her dream could become a reality. 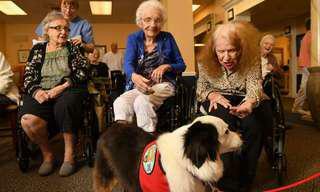 She had read up on the benefits a therapy dog could offer seniors dealing with illness and dementia, and she had gotten approval to start a daily therapy dog program at Gulf Coast Village. This runt was nothing like the dog she'd had in mind. But there was something about him. His mismatched eyes, one black and one brown. And the way he nuzzled his way into her arms, grunting in pleasure. The breeder turned to his wife and said, "That's her dog." Laura couldn't help but agree. "I'll take him," she said. Laura took the puppy home, naming him Jack. Shortly after his first birthday, he completed his training through the Alliance of Therapy Dogs and was ready to go to work. There was only one problem. Because Laura worked full-time, she couldn't supervise his visits with residents at Gulf Coast Village during the day. No one else on staff could do it either. Who else was there? One person popped into Laura's head—Roger Wieland. A 90-year-old retired veterinarian and World War II vet, he'd been living at Gulf Coast Village with his wife, Irene, for the past three years. Before moving to Florida, Roger had owned three veterinary hospitals in Michigan. When Jack was a puppy, Laura had introduced him to Roger. They'd clicked right away. "Would you be Jack's handler here?" Laura asked Roger. "Me?" he said. "I'm no spring chicken!" Laura assured Roger that he could keep his normal schedule of activities but add visits to Gulf Coast Village's assisted living residents. Roger's eyes lit up. "I'll do it," he said. That's how Roger and Jack became the most recognizable duo at Gulf Coast Village. Their day starts promptly at 8 a.m., when Roger stops by Laura's office to pick Jack up. First stop: tai chi class. Jack gets up to greet every person who enters the classroom and waits patiently as Roger exercises. The rest of the day is spent meeting and greeting residents, including people in the memory care and rehabilitation units. "To see them together is remarkable," Laura says. "Jack looks at Roger like Opie looks up at his dad on The Andy Griffith Show." 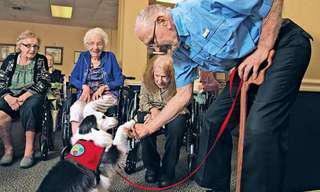 Tom Hafer, a Volunteers of America minister and chaplain at Gulf Coast Village, says he's never seen a dog quite like Jack. Not only does he get residents up and moving, but he's able to step into the world of people with Alzheimer's and dementia. "He allows residents to live in the present," Tom says. "In that moment, aches and pains are suspended. Jack has an uncanny ability to sense when someone needs him." Like when Roger took a tumble in the hallway last year. Nothing was broken. Even so, Jack never left Roger's side. "Jack was continuously licking him as if to heal him," Laura says. "I didn't train him to do any of that. He's just a very old soul." That old soul has made Jack an invaluable member of the Gulf Coast Village community. Residents and staff greet him like he's a rock star. Not bad for the runt of the litter. "A dog will light up people in a different way," Tom says. "Jack is very much a minister to us all."